This magnifier is worn around the neck. For sewing, knitting, needlecrafts and reading. 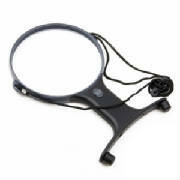 2x power hands free lighted neck magnifier. It's built-in twin LED lights prevent eyestrain.